FREE TUESDAY AUGUST 8 2017 379 7100 THIS WEEKEND Proudly locally owned and published by Star Media Award winning publishing group Fantail (Piwakawaka) WIGRAM AIR FORCE MUSEUM 10AM - 5PM WWW.GOGREENEXPO.CO.NZ Harewood, Burnside, Bishopdale, Bryndwr, Fendalton, Merivale, St Albans, Mairehau, Papanui, Casebrook, Redwood, Regents Park, Styx Mill, Northwood, Belfast, Strowan COMPLAINT: St Albans School pupils walk past the sign on the fence of 85 Westminster St opposite their school. Right – A mobile sign which is placed at different locations in the area. It does not need to be removed. 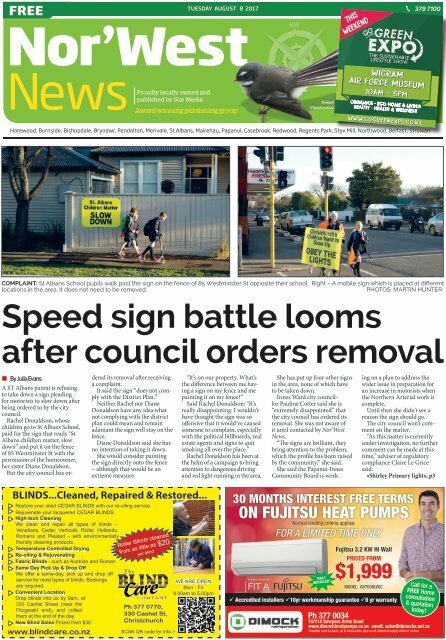 PHOTOS: MARTIN HUNTER Speed sign battle looms after council orders removal • By Julia Evans A ST Albans parent is refusing to take down a sign pleading for motorists to slow down after being ordered to by the city council. Rachel Donaldson, whose children go to St Albans School, paid for the sign that reads “St Albans children matter, slow down” and put it on the fence of 85 Westminster St with the permission of the homeowner, her sister Diane Donaldson. But the city council has ordered its removal after receiving a complaint. It said the sign “does not comply with the District Plan.” Neither Rachel nor Diane Donaldson have any idea what not complying with the district plan could mean and remain adamant the sign will stay on the fence. Diane Donaldson said she has no intention of taking it down. She would consider painting the sign directly onto the fence – although that would be an extreme measure. “It’s on our property. What’s the difference between me having a sign on my fence and me painting it on my fence?” Said Rachel Donaldson: “It’s really disappointing. I wouldn’t have thought the sign was so offensive that it would’ve caused someone to complain, especially with the political billboards, real estate agents and signs to quit smoking all over the place.” Rachel Donaldson has been at the helm of a campaign to bring attention to dangerous driving and red light running in the area. She has put up four other signs in the area, none of which have to be taken down. Innes Ward city councillor Pauline Cotter said she is “extremely disappointed” that the city council has ordered its removal. She was not aware of it until contacted by Nor’West News. “The signs are brilliant, they bring attention to the problem, which the profile has been raised by the community,” she said. She said the Papanui-Innes Community Board is working on a plan to address the wider issue in preparation for an increase in motorists when the Northern Arterial work is complete. Until then she didn’t see a reason the sign should go. The city council won’t comment on the matter. “As this matter is currently under investigation, no further comment can be made at this time,” adviser of regulatory compliance Claire Le Grice said. •Shirley Primary lights, p3 BLINDS...Cleaned, Repaired & Restored... Restore your oiled CEDAR BLINDS with our re-oiling service. Rejuvenate your lacquered CEDAR BLINDS High-tech Cleaning We clean and repair all types of blinds – Venetians, Cedar, Verticals, Roller, Hollands, Romans and Pleated – with environmentally friendly cleaning products. Temperature Controlled Drying Re-oiling & Rejuvenating Fabric Blinds - such as Austrian and Roman Same Day Pick Up & Drop Off We offer a same-day, pick up and drop off service for most types of blinds. Bookings are required. Convenient Location Drop blinds into us by 9am, at 330 Cashel Street (near the Fitzgerald end), and collect them at the end of the day. New Blind Sales Priced from $30 Roller Blinds cleaned from as little as $20 per blind Ph 377 0770, 330 Cashel St, Christchurch www.blindcare.co.nz SCAN QR code for Info > WE ARE OPEN Mon - Fri 8.00am to 5.00pm 30 months interest Free terms on Fujitsu heat pumps Normal lending criteria applies. For a limited time only FULLY INSTALLED* Fujitsu 3.2 KW Hi Wall Priced From $1,999 MODEL: ASTG09LVCC Accredited installers 10yr workmanship guarantee 6 yr warranty Call for a FREE Home consultation & quotation today! Ph 377 0034 15/114 Sawyers Arms Road www.dimockheatpumps.co.nz email: sales@dimocks.net.nz *Installed back-to-back, up to three metre pipe run & electrical supply within 6 metres.